I LOVE to cook. Or maybe it is that I love to eat, and I know that in order to enjoy something delicious I need cook something delicious first. I'm not a picky eater at all, but I do live with a few, so dinners can be very hit-or-miss in our house. I get nervous to try anything new for the picky ones, but I'm almost always sure to like it. This make my repertoire of meals seem repetitive at times. I'm all about trying new things, but if a meal isn't a hit all around, it tends not to make it to the dinner table again. All of that being said, I am on the constant search for recipes, so when I had the opportunity to review Gather Around The Amish Table by Lucy Leid, I was super excited. What is wonderful about this cookbook, aside from all of the mouth-watering recipes, is that several of the recipes throughout are accompanied by short stories from the person/family that submitted the recipe. The author, Lucy Leid, is an Old Order Mennonite who lives in Lancaster County, Pennsylvania. She came up with the idea for this unique-style cookbook from a newsletter called Die Botschaft. This was a weekly newsletter that delivered news from all around several of the Amish communities across the United States. Included in this newsletter, was a section called Ivverich und Ender which means "what's left over, the ends". In this section would be all of the miscellaneous material, including recipes. 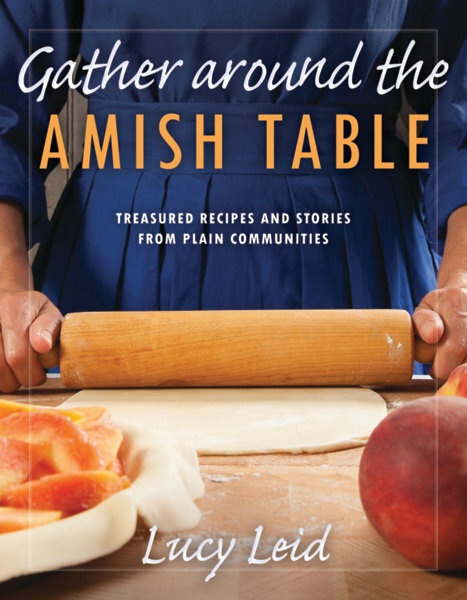 Sharing recipes is a beautiful act of care, and Leid wanted to create Gather Around The Amish Table to celebrate the tried and true recipes from the Amish tables across the nation. She required those who submitted recipes to also provide a snippet of information about the recipe or a story to accompany it. This way, while you are cooking, baking and preparing meals for your family, you can read the funny and heartfelt stories of how they were born. So, the first recipe that I tried out of this cookbook was the Bacon Beef Balls, however, they disappeared so quickly that I never had the opportunity to capture them. They were so, so, so good, and I will make them over and over again. They are like a meatballs with rice and bacon inside of it, topped with a savory tomato sauce. The next recipe I tried were the Drop Biscuits, because they were easy, and went well with our ham, pineapple, and mashed potatoes. They turned out wonderful as well. And, because I have a super sweet tooth and love me some chocolate, I also made the Moist Chocolate Cake. We ate that all in a couple of days. I don't know if I should be proud of this or embarrassed. I topped it with my own marshmallow frosting, but the cake was divine. It is very moist, and heavy, but in a good way. And the best part? The cake batter does not contain eggs, so I didn't have to feel guilty letting the kids lick the beaters. Actually, the best part of cooking from scratch is that you know what you are putting onto your plates, and furthermore, into your bodies. This cookbook is categorized, so finding recipes is a breeze. Each page has a colored strip that runs across the top. Each section has its own color, and each particular section's name is displayed at the top corner of the page as well. I found it very easy to navigate. Some recipes I am really looking forward to trying out are the: Favorite Soft Pretzels, Easy Hamburger Soup, Amish Macaroni Salad, Onion Rings, Chicken Pot Pie, Glazed Peach Pie, S'More Bars, Yoder's Eight-Minute Cheesecake and Real Lemonade. As you can see, there are an array of different recipes throughout this cookbook. If you are interested in purchasing your own copy of this cookbook, you can do so here. Please be sure to read some of the other Lifuse reviews here. Reading to my children at bed time was something I always wanted to make a "routine" in my house. I remember my mother reading to me as a small child, and I wanted that same special time each night with my own children. Plus, it gives them an opportunity to choose what book they want to hear that night. Sometimes in the life of a young child, it's a great privilege to make their own choices. Lately, my 3 year old has been choosing the same book over and over, and that book is Let's Learn About The Lord's Payer by Catherine DeVries (illustrated by Ryan Jackson). The main character is a 4 year old girl named Emma, who speaks right to the child as she teaches them the Lord's Payer and what it means. Let's Learn About The Lords Prayer is actually the first book in the HeartSmart series which was developed to teach children scripture in fun and engaging ways, allowing them to open their heart to God from a young age. What is unique about this series is that it pairs the scripture with song, so you can deliver the entertainment on another level too! The author, Catherine DeVries has written 20 books for children, so she is no newbie when it comes to pleasing their little ears and eyes. 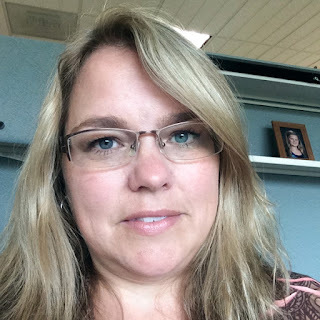 She is an associate publisher of Children's Resources at David C Cook, where she leads product development for The Action Bible collection, which has sold over a million copies! She lives with her husband, their three children and their large furry dog in the Colorado Mountains. My 3 year old daughter has been LOVING this book. Each night, without fail she requests that we read this book. She always answers the questions that "Emma" asks, and has been very successful at learning the Lord's Prayer. She just started preschool earlier this month where they are learning The Lord's Prayer, so this book helps us to practice a home what she is also learning in school. I cannot forget to mention the illustrations too. I feel that they are perfect for this title, and very engaging for the young children. The book itself is like a board book so it much sturdier than other books we have - this was smart thinking! 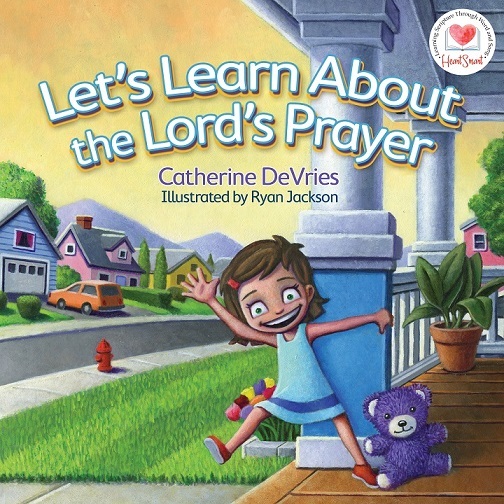 You can purchase your copy of Let's Learn About The Lord's Prayer here. Please be sure to read what other Litfuse Reviewers had to say here. I have a Bachelor of Science in Psychology and a Master's in School Counseling, so it's likely that I have a clear interest in human behavior. While I tend to be most interested in the Mystery genre when it comes to reading for pleasure, I will occasionally choose books to read that give me insight into the career path that I have ultimately chosen. Hence, my latest read, Dataclysm: Who We Are (When We Think No One's Watching) by Christian Rudder. This novel was born from the loads of statistical information collected via the online behavior of millions of people. See, the author is actually one of the founders of the dating website OkCupid, and is also a mathematician. Put those two things together, and you have some great data about human behavior! I have always really loved math and statistics, and obviously, human behavior, so I was sucked right into this book. Much of the information isn't necessarily surprising, however, it does give you a peek into the potentially disturbing world we live in. And it also opens your eyes to how much data our social media activity can predict about who we are as individuals. Overall, it's very fascinating how unique we all are, yet how predictable our behaviors can. One quote that summarizes what much of the book about is, "Unfortunately, surveys have historically been unable to uncover true attitudes on topics such as race, sexual behavior drug use, and even bodily functions, because respondents edit their answers. ... And often the ugliest, most divisive, attitudes remain behind a veil of ego and cultural norms that is almost impossible to draw back, at least through direct questioning. It's a social scientist's curse-what you most want to get at is exactly what your subjects are most eager to hide." Essentially, most forms of data collection always have some sort of user bias. In this book you see a less-biased view of information because it comes from internet user searches and on-line behaviors that people likely consider to be "when no one is looking". Surprise! There are people looking and analyzing this data all of the time.